In this article we introduce you to five new recipes for some of the famous Mediterranean snack dishes you can now prepare even faster and more easily. Of course with our genuine homemade ajvar. The main features of Mediterranean cuisine are simple dishes made with just a few ingredients. Their richness of taste comes from mandatorily fresh, finest vegetables and foods grown in a natural way under the hot Mediterranean sun. Well known as one of the most delicious and healthiest kitchens, not only because of how and with which ingredients food is prepared along the Mediterranean coast, but also the way in which it is enjoyed. This is most often in a large and joyful group of friends gathered around a number of large and small full of colorful, fresh delicacies with a long and vibrant conversation that often ends up in song and even dance. 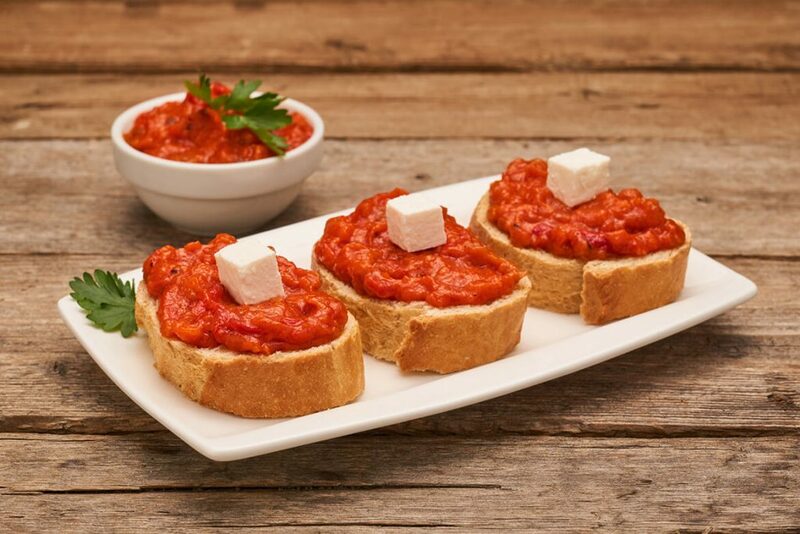 If in reading this you already thought to yourself that ajvar and Mediterranean cuisine are more similar than one would’ve thought at first glance, let us ask you this: did you know that the main ingredient of some of the most popular Mediterranean spreads is none other than the red roasted pepper? Just like in our genuine homemade ajvar. And our ajvar with olive oil is an ideal, light, quick and irresistibly delicious substitute for roasted peppers in these Mediterranean snack spreads that simply invite you to share them with pleasure and leisurely with the dear people this summer. Refreshing creamy spread or dip, depending on what kind of texture you prefer. Perfect for some hot pie bread to finish in it or maybe some crispy fresh or roasted vegetables. Creamily whip 500g of feta cheese and 100g of cream cheese, add 5 tablespoons of ajvar with olive oil, juice of one lemon, salt and pepper. If you like, you can add a crushed clove of garlic, a few dried tomatoes or some chili peppers sauce, and if you want to make a dip, add 150ml of Greek yoghurt. Although originally from Italy, as its name suggests, Romesko is an essential part of famous Spanish tapas. The rich sauce of spicy sweet smoked aromas with visible pieces of roasted peppers and other ingredients, it goes perfectly with fresh or grilled vegetables, olives, cheese, meat, in fact, on second thought, it’s astonishing in every combination. In a food processor, in pulse mode, chop 100 g of baked almonds, 100 g of baked hazelnuts, 1 clove of garlic, 70 g of tomato purée, 2 tablespoons of chopped parsley, dried chili peppers to taste, 2 to 3 tablespoons of olive oil, and pepper to taste. This traditional baked peppers and walnuts spread is popular throughout eastern Mediterranean. Masters of cuisine say that, although it can be made in the blender, for the best results, peppers need to be finely chopped and crushed together with walnuts in a mortar with pestle. Unless you have the main trump card for this recipe – already chopped peppers spiced with the finest olive from the jar of genuine homemade ajvar. 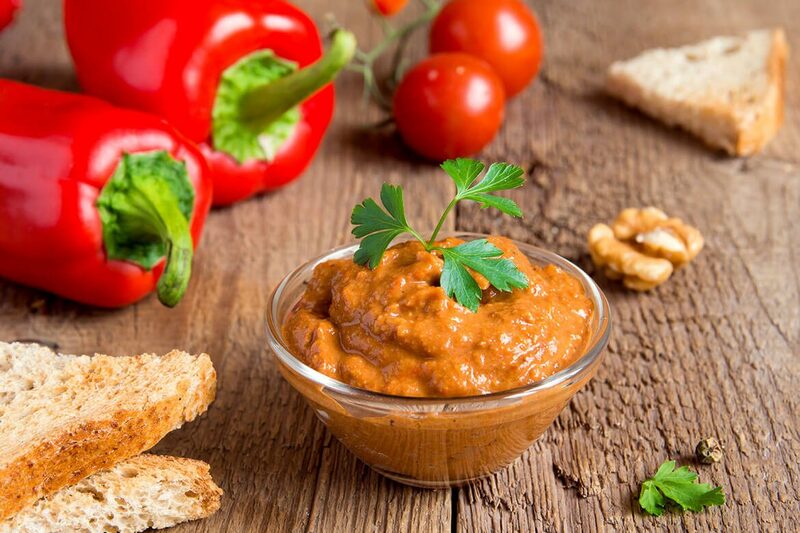 Mix 50 grams of finely chopped or ground walnuts with 3-4 tablespoons of ajvar with olive oil. Add 50 grams of bread crumbs, half a tablespoon of fresh lemon juice, 1 teaspoon of pomegranate molasses, a pinch of caraway, a pinch of crushed dried chili peppers and salt to taste. Combine well and serve sprinkled with olive oil and pomegranate seeds. Since we’re already on the eastern coast of the Mediterranean, we must try hummus, agreed? 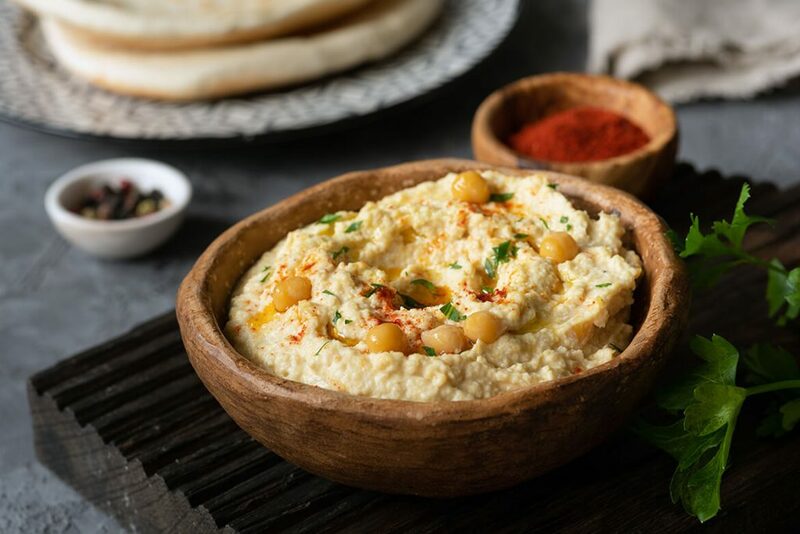 The famous chickpeas and sesame paste spread is made in many varieties of flavor, and one of them that we especially love is the one with baked red peppers. Or, in our case, ajvar with olive oil for humus work is ready in no time at all. In the processor, thoroughly grind 150g of cooked chickpeas or those from the can. Add 2-3 tablespoons of tahini, 1-2 teaspoons of dried sweet or chili peppers to taste and a couple of teaspoons of water, as needed. Chop everything thoroughly into a creamy mixture, mix 4 full tablespoons of ajvar with olive oil, and combine well. Serve hummus topped with a couple of tablespoons of olive oil and sprinkled with finely chopped parsley or fresh mint. Fantastically light and almost foamy, this spread or dip is another true representative of Mediterranean cuisine in which legumes are an indispensable ingredient. Serve it with meat, vegetables, risotto, pasta or simply spread it on a slice of fresh bread, it’s wonderful anyway. In the processor, chop 200 g of white beans, or use canned beans, with a fist of fresh basil, a large clove of garlic, a teaspoon of balsamic vinegar and 3 to 4 tablespoons of ajvar with olive oil. Mix everything thoroughly into a uniform paste; add a pinch of salt and pepper to taste and serve with chopped parsley or a few leaves of fresh basil. And there’s of course our main star for all gatherings and hanging outs with friends when we want to have some irresistible summer bites! 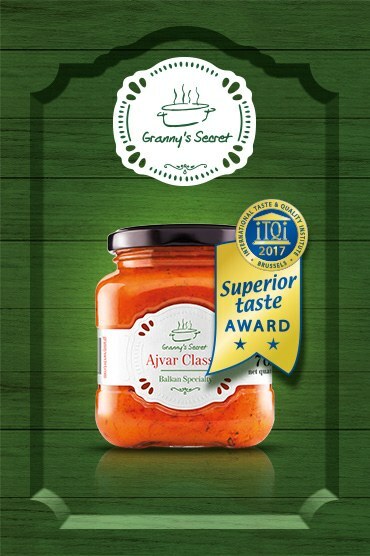 Ajvar with the finest roasted peppers made according to the homemade production method, enriched with the tastes of cold-fried extra virgin olive oil, a little vinegar and a pinch of Himalayan salt. 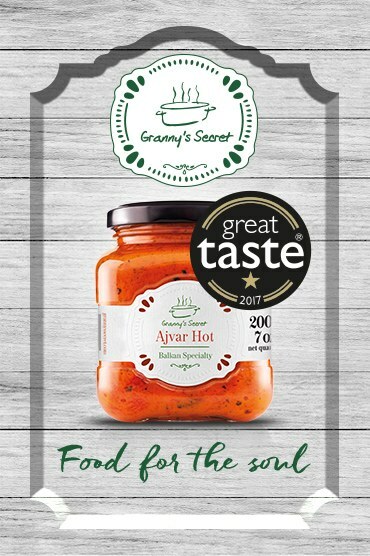 With such soft, full and fresh taste given to carefully prepared peppers just by olive oil, our ajvar proved to be an extraordinary ingredient not only in local cuisine but in Mediterranean one, as well. And more than a practical assistant, too! Instead of baking, peeling, squeezing and chopping peppers for one of our Mediterranean spreads, we’ve simply opened a jar of our ajvar with olive oil. In addition to Mediterranean spreads, we recommend that you try it as an ingredient in juicy burger, light, stunningly fragrant quiche, any of aromatic sandwiches or simply serve it with fresh ciabatta, chilled salad and olives, as a favorite summer spread for everyone. WOW! My daughter and her boyfriend brought me a jar of Ajvar. Before I put it away decided to taste it. 🙂 Problem is, now there is nothing left to put away. I’ve eaten the entire jar with a spoon and/or chips. Never tasted anything so beautiful!! Of course, now I’m looking at the website to find out if I can purchase some in Hungary – but find no information. Dear Julie, thank you for your message, we are more than happy to hear that you like ajvar Bakina Tajna.